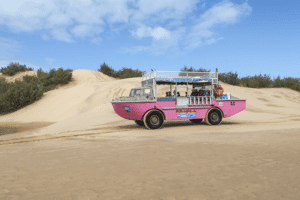 10 Oct We love to lend a helping hand to the locals..
Our caring and compassionate Skippers and Tour guides are always on the lookout for sick, injured or tired wildlife and marine life while on tour. As our Skippers and Tour Guides have actively been involved in many turtle, shorebird and wildlife rescues over the years, we have refined the most suitable methods to assist these animals and we work towards their survival with many other helpful and trained people in our community. Onshore we work in closely with local wildlife carers, one of which being our Office Manager Lee and other volunteer organisations statewide. 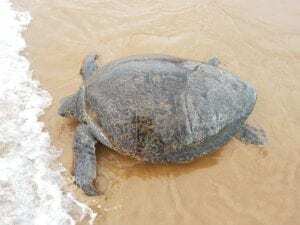 Even though we are situated a little “off the beaten track”, to the north of us near Gladstone we are very lucky to have the Quion Island Turtle Rehabilitation Centre which we have been working with for many many years. To the south of us is Australia Zoo at the Sunshine Coast. If the animal is deemed to need a little extra helping hand we send them to either of these amazing facilities or directly to our local wildlife carer who will asses the animals situation. Too often, turtles that we rescue have ingested plastics. This is a growing concern, not only across the Southern Great Barrier Reef region, also across the globe. Plastic waste from ships and from land has been increasing for too many years and turtles are not the only marine life suffering due to this. When a turtle ingests plastic over time it swells in their stomach. Being a turtle they need to get to the bottom of the ocean to feed. If a turtle has plastic inside them, their stomach bloats and they float (they are known as a floater) making it impossible to get down to the sea floor to feed. They become emaciated and that is when we find them on our beaches. Unfortunately for Mr Turtle it means at least 6 months in recovering to first remove the plastic then gain enough weight back to be healthy to live again. We do love getting these turtles back and seeing them striving and kicking again as we release them where we found them! Boat strikes are common during turtle nesting season (summer) in the Town of 1770 and on Bustard Bay. We are located on the Southern Great Barrier Reef in close proximity to one of the largest industrial ports in Australia. With an increase in shipping travel over the last few years, due to extra coal and gas transportation activity, we have seen an increase in boat strikes on marine creatures. A very long recovery period, if not severe, always happens with boat strikes. Yvonne “the wildlife carer” as she is known around town is an amazingly massive hearted women who was been caring for our local wildlife for years. We work in very closely with Yvonne and she is awesome at giving us regular reports on the progress of the loved patients! Yvonne is a huge part of our community and has nursed multiple amounts of animals back to health. Lee our Office Manager loves looking after bush babies found on tour. It is not out of the ordinary for her to have recovering fur babies around the the LARC! office resting while she answers the phone. 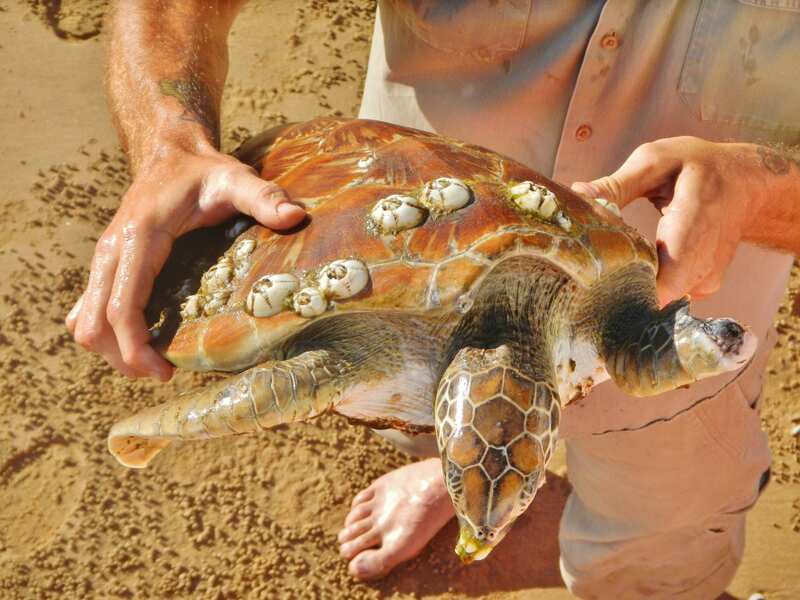 Discovery Coast Environment Group are now a branch for all Marine Strandings in our region, including the big ones! 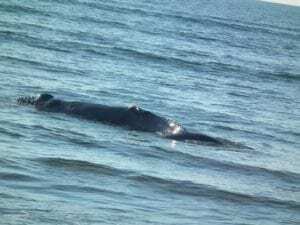 If whales wash up deceased the volunteers co ordinate the clean up and report the stranding to GBRMPA and other government agencies. Sometimes university students attend the strandings for research purposes. Smelly business…. A few years ago Bondi Vet, the famous Dr. Chris Brown, came to town for a LARC! cruise with a difference. This story began as an after surf chat on a secluded beach in Indonesia where LARCman Neil met Chris Brown on a surfing holiday. As Neil does with everyone he meets, he invited Chris to come visit and come LARCing with us. Thinking nothing more of it, months passed, then one day Neil got a phone call from Chris! 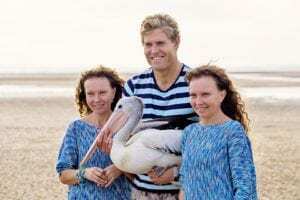 Chris had preformed an operation on a pelican from the Sunshine Coast and it had been recovering with “the Twinnies” – twins that are famous on the Sunshine Cost for their love of birds and helping them their rehabilitation. Chris needed the pelican to be released into a flock of healthy and established pelicans so that it could be taught by the other pelicans how to hunt again. Johnnie (the female) pelican was transported to the Town of 1770 with the Twinnies and Chris Brown. LARCman Neil took them out on the sandbar and released Johnnie with TV cameras rolling. For the following weeks Neil kept an eye on Johnnies integration into the local pelican population. After a while Johnnie decided that she was one of the locals and started hunting and feeding all by herself. She now hangs out near the 1770 boat ramp munching on fishermen’s leftovers and leads of relaxing 1770 lifestyle.